I remember feeling very depressed just after I received the letter stating that my daughter had been allocated a place at our chosen school. She was getting dressed in a floral pinny that she was outgrowing, and I realised that there was no point in buying another one, as she’d be at school five days a week, and spend the majority of her time in grey pinafores and navy blue sweatshirts. My mood was not lightened in the least by the school wear on display at my local supermarket. It’s cheap, yes, but that comes at a cost. It was also scratchy and made from unpleasant fabric. I came over all Highgate Mums at the thought of my little treasure wearing it, tempered with the knowledge that it was almost certainly made by a woman with children of her own, who was barely paid enough to feed them. Lucy Siegle in “To Die For” details many highly depressing examples of cost cutting in garment manufacture. Once a company has cut the costs of fabric to the bone, the next thing to be reduced is the wages. 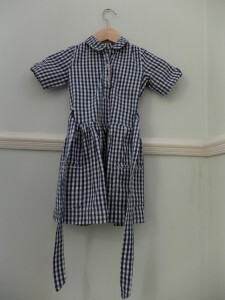 Whilst sewing is increasing as a hobby, I was more interested in using the skills I’d learned from my mother for a utilitarian purpose: something beyond party frocks or scatter cushions. This is, after all, what women used to do before the industrial revolution, and outsourcing, made clothing so cheap that it can be treated as disposable. Time was when clothing was so precious that a garment was endlessly repaired and altered. Antique clothing is rare because it was worn and used until it literally disintegrated. When we look at old images of, say Victorians, we forget that just about every item of clothing they wore would have been hand stitched – often by the wearer’s mother, sister, daughter, or themselves. Do people make their own school uniforms, I wondered. Do they? Google informed me that the answer is “a few, not many” and most seem to be Mormon women in Utah with dozens of children. Well, if they can find the time, I probably could. * Normal looking (the most important factor for all concerned. I don’t want to be embarrassed, nor an embarrassment. * Easy for me to take care of. I don’t mind a little light ironing but if I can get away without bothering, I will. * Accessible. A 5 year old is wearing this stuff and she has to be able to get it on and off herself. Is this something I think everyone should attempt? Not really. I don’t have much cash but I do have a little time, and I learned to sew a long time ago. I have all the kit, acquired over the years, and a space to do it in. Take away one of those factors, and I’d have probably found a different solution. But I hope this series of posts is informative. Previous PostSilence.Next PostA Checky Dress.